During early spring, we call up the weather forecast many times a day, always hoping for better results. As you may have noticed, April’s been grim. On Sunday, Silas went to Grandma Darlene and Grandpa Gary’s, and we went up to the farm. Jason pushed the BCS walking tractor out of the shed, and, much to his delight, it fired up for the first time this season after just a few tries. He tilled up the soil in the lower greenhouse, and we hand-shoveled four raised beds. The BCS can make raised rows, but we don’t want to tear up the greenhouse walls. This machine is heaven-sent when it comes to building up beds in our exterior gardens. We do not miss shoveling 100-foot rows by hand. Jason tilling up snow with the BCS. Last season, we planted cucumbers in the lower greenhouse, along with tomatoes and peppers. The cucumber seeds we order are the most expensive that we plant. It’s about $75 for three relatively small packets. After taking good care of them for weeks last year, we only enjoyed one round of cucumbers in our CSA boxes, and had virtually none to take to market. Cucumber beetles went right on down the row, sentencing the once lush plants to death. This year, we’re growing two varieties of cucumbers, and they'll fill the entire lower greenhouse. We’ll attach window screens to the sides of the house, so we can still roll up the plastic and let cooler air in. We’ll also set cucumber beetle traps in the roof peaks. Those are some pretty cute cukes, don't you think? Drip tape instead of sprinklers will water the cucumber plants, to help avoid diseases. Another sign of spring around here: boxes. Silas loves helping Jason open them, and this week’s deliveries brought 175 pounds (thank you, delivery guy) of potatoes, including Strawberry Paw and Yukon Gold. Oh, the joy of potatoes, fresh out of the ground, roasted with butter and herbs. We also received 50 crowns of rhubarb, and 24 canes of blackberries. Red and golden raspberries are on their way. Blackberry canes arrived this week. In just two years, we can expect lots of berries, we're told. This season (hopefully in June), another greenhouse will go up. We were approved for a grant through the Natural Resources Conservation Service. We learned that our proximity to the West Branch of Sugar Creek benefited our farm during the grant scoring process. This creek is a natural reproduction trout stream, according to the Pennsylvania Fish and Boat Commission. This means that the waters naturally support reproducing populations of trout. The West Branch of Sugar Creek originates from a pond in State Gamelands Number 69. It flows past our house and our farm, traveling along Dingman Road and then dipping under state Route 27, eventually joining its namesake, Sugar Creek. This creek winds through forests and fields until it reaches Franklin and meets French Creek. For such a small waterway, the West Branch certainly flows loud and fast at times. Our house is a quarter of a mile from the creek, and we can hear it rushing after a snowmelt or heavy rain. A portion of the West Branch of Sugar Creek flows through the Shire. Er, rather, Troy Township. At this time of year, creek banks and roadsides are inhabited by baby skunk cabbages. 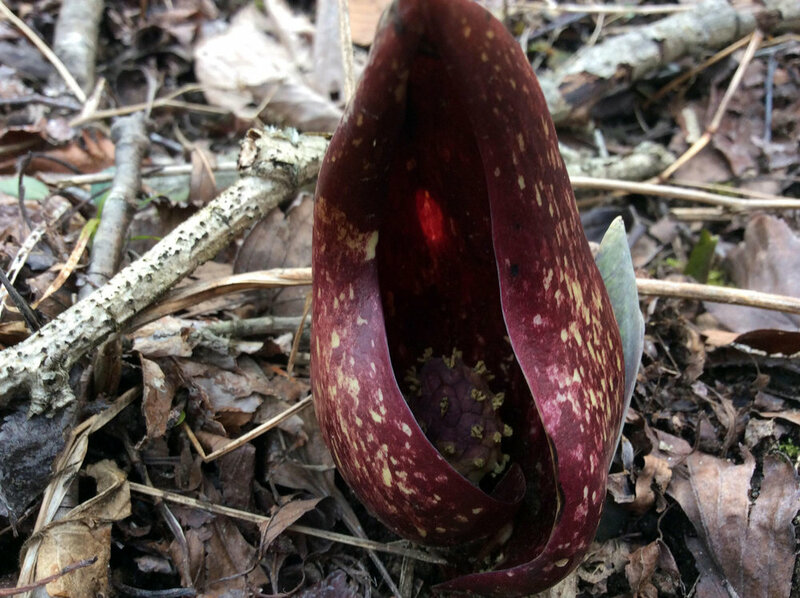 When skunk cabbages first poke out of the earth in early April, they look like something planted by aliens. They’re short, fat, conic-shaped plants, striped burgundy and chartreuse. The exterior is the “spathe.” Sheltered inside the spathe, is a spiky, little ball. This is the flowering part of the plant. The spathe makes its own heat by oxidizing starches stored in its roots. The temperature inside the spathe is typically around 30 degrees warmer than the outside air. A family friend told me her mother used to cook up skunk cabbages. This little weirdo is a baby skunk cabbage. This time of year, the bright green moss that grows on the rock walls along Dingman, and up the tree trunks, which are soaked black from the almost constant snow and rain, is eye-catching. Another noticeable forest floor decoration this time of year, without the grasses and wildflowers to conceal it, is garbage. Mostly beer (typically light beer, why is this?) and energy drink cans. It doesn’t matter how great a person’s accomplishments in life, how kind they are, or how generous, tossing one can out the window negates all prior meritorious conduct. Recognizing an opportunity to indoctrinate him with my deep prejudice for litterbugs, I explained how someone who does such a thing is lazy and disrespectful, and defiling such beautiful countryside can only be a sign of deep, deep, self-loathing. As he bobbed along, eating a snack out of a Ziploc bag, he nodded, presumably absorbing the message. When the stroller was parked, he finished his snack, stood up, looked at me, raised his hand in the air, and released the bag to the ground. The strangled cry that escaped my throat made him smirk. He’s three. I’ll forgive him. May he never drink light beer and energy drinks.